My data sheet ("srData") is a pivot table that is filled using a userform. All data have a unique ID in column A of the data sheet. 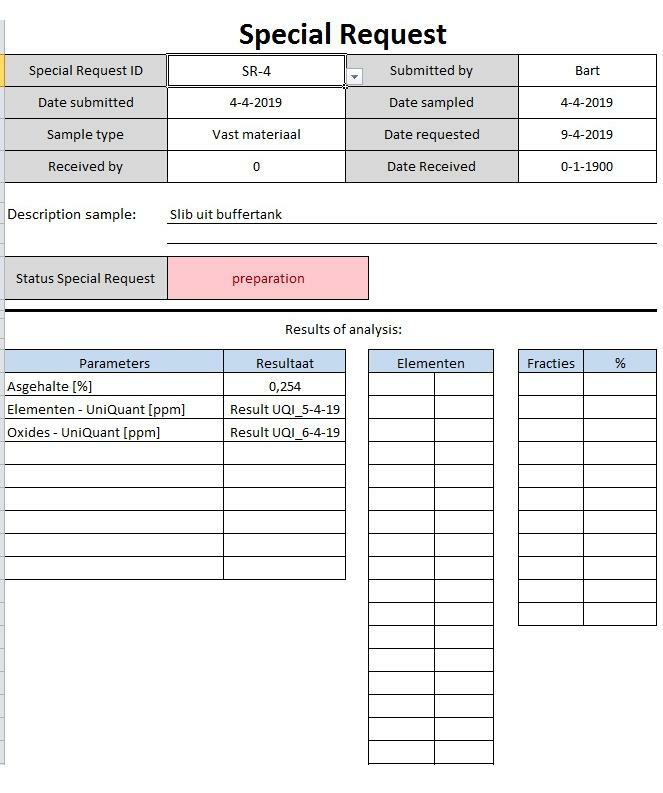 In the userform checkboxes are selected, which will change the cells, in columns K:AB, interior color to white(2), else interior color is grey(15) In my main worksheet ("Formulier"), based on the value of a drop down box (C6)where the unique ID is selected (i.e. SR-1, SR-2,SR-3 etc...), the headers from sheet("srData") are returned in column A of sheet("Formulier") starting from row 20 if the interior.colorindex=2. The values in the cells are returned in column D starting from row 20. Now in Column Y and Z of ("srData") I have placed a hyperlink which links to a PDF. (see SR-4 first image) In column Y and Z there will allways be hyperlinks in the cells with interior.colorindex=2.
' Write value from Criteria Cell Range to Search Value.
' a reference to Source Found Cell Range.
' Check if Search Value not found. Exit if.
' Write row of Source Found Cell Range to Color Row.
' Release rng variable (not needed anymore).
' Copy Header Range to Header Array.
' Copy Color Range to Color Array.
' *** Copy Color Range to Value Array.
' later overwritten with the Color Indexes.
' Loop through columns of Color Range/Array.
' element in Color Array.
' Resize Target Array to Number of Elements rows and one column.
' *** Resize Target Value Array to Number of Elements rows and one column.
' Loop through columns of Color Array.
' Count row in Target Array.
' element in current ROW of Target Array.
' element in current ROW of Target Value Array.
' Erase Header and Color Arrays (not needed anymore).
' Target First Row and Target Column, by Number of Elements.
' Copy Target Array to Target Range.
' Copy Target Value Array to Target Value Range. In this case you end up with a link to a file in cell A1 and with a link to a webpage in cell A2. You can modify this to suit your needs.